The Society of St. Vincent de Paul – Phoenix – Artworks PHX – a business-arts campaign in Phoenix, Arizona USA. Gift of incredible art provides healing to those in need. No one questions the healing power of art. Perhaps that’s the sentiment that led to the incredible gift of art that sits on the campus of St. Vincent de Paul. 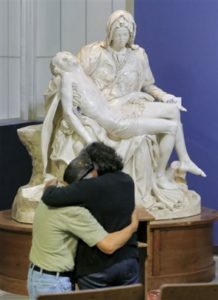 An exact replica of Michaelangelo’s world-famous “Pieta” provides peace and comfort where it is needed most – in the dining room where St. Vincent de Paul serves thousands of meals to primarily homeless individuals who have nowhere else to turn for help. The replica was created using molds of the original sculpture, which were made in 1932. It was donated to St. Vincent de Paul in January 2013 through a collaboration between the artist, Arte Divine, the company that creates the sculptures from the mold, local donors and supporters and the Vatican Observatory Foundation that licenses the mold’s use. The sculptures have typically been placed in churches or cathedrals, but the artist felt strongly that he wanted it in a place where it could inspire and bring hope to people who would potentially never have an opportunity to see the original piece. The placement of the stunning art at St. Vincent de Paul provides a continuous source of encouragement and hope for everyone – the organization’s staff; the volunteers who provide help for people’s physical, mental, and spiritual needs; and thousands of individuals who are served on the campus each year. ‹ Picture Your Company Here!